NEW PATREON SUPPORT PAGE – Yay! The Low Tox Club is BACK and here to stay (I had to take it off line 18 months ago when I got sick with the mould stuff), but it’s different: YOU decide how much you want to spend to be a part of it. I’m interviewing one of the most forward thinking raw material procurement legends in the world… BEST JOB EVER! I do interview people from brands from time to time and I just want to say here, these are NOT sponsored shows. This is simply me bringing you some of the best thought leaders I know to help us truly understand what goes into a business when they’re 100% for people + planet at the core of everything they do. This is the perfect show to celebrate Fair Trade day coming this Saturday May 12 too! Very rarely do you find a company so transparent, so vocal about social and environmental injustice and so good at growing a healthy business, as Dr Bronner’s. 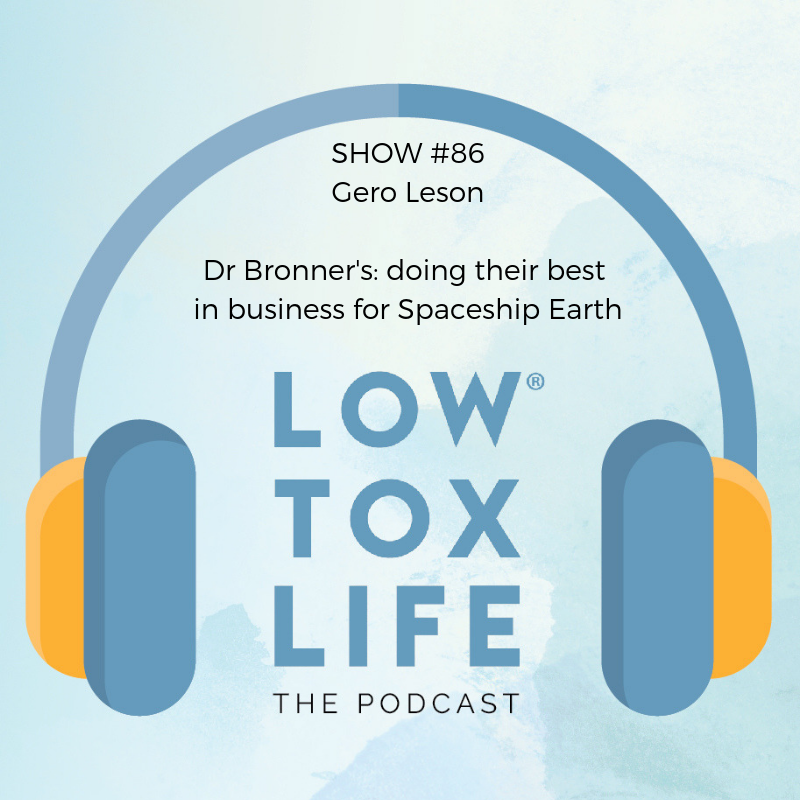 If you’d like to find out more about Dr Bronner’s story, check out show #2 where I talk to Lisa Bronner, granddaughter of Dr. Emanuel Bronner, founder of Dr. Bronner’s. A family run business from way back, it’s one of my favourites for many reasons. I wanted to bring on their VP Gero Leson a phd in environmental science, who works to set up incredible partnerships with communities in developing countries to set up their supply chain. Rarely do you get to look under the hood of a procurement and production cycle like this. It will also highlight that nothing is black and white and yes – shock horror – there can be such a thing as sustainable, ethical palm oil. 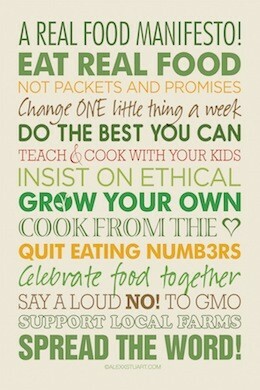 This is for the nerds who just love digging into how business can be a HUGE part of the change towards a better world. Gero doesn’t hold back. SUCH a good chat. I hope you love it and think even more fondly of your humble castile soap the next time you pick it up. Dr Bronner’s is passionate about investing in causes that people can relate to. They’re committed to the economic and social development of the farms and communities they source their raw materials from through a number of fairtrade and regenerative projects. Fairtrade for Dr Bronner’s has become the baseline. Everything they do as a company and their entire value chain is designed to support sustainable operations and embrace fairtrade principles and practices. When it comes to organic, mainstream certifications mostly focus on making sure no pesticide is used in the production. Regenerative practices go beyond that to support farmers in improving soil quality. On top of factory farming and fossil fuels, depletion of soil contributes to one third of the rise of CO2 in the atmosphere. Focusing on agricultural practices that look after the soil has huge potential to help improve the atmosphere. Dr Bronner’s has a strict mandate to shift to more and more regenerative practices for all projects they’re involved in in relation to raw materials sourcing. Dr Bronner’s company culture is highlighted in the six cosmic principles that put forward values of community, collaboration and contribution. 78% of the revenue of the company is spent on activism and charity contributions. 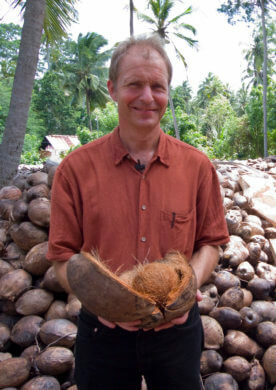 Dr Bronner’s uses palm oil in its products as it is a super versatile and useful ingredient to make soaps. The problem with palm oil is the way it is being produced, destroying vegetation and the communities who live on the land. Dr Bronner’s has chosen to source their palm oil from sustainable and responsible sources by not having their own plantation and processing the palm oil in a community based environment. Dr Bronner’s work focuses strongly on setting up strong and valuable partnerships with farmers, contributing to preserving their cultures and enriching their communities and as a consequence supporting them to produce the best quality raw materials that will be used in Dr Bronner’s range. Through the work they’ve done in these communities, they’ve been able to encourage locals to stay in their farms instead of relocating to nearby cities and give them the means to develop valuable businesses that promote sustainable farming and look after the land. I love the calendula cream for all scrapes and bumps and so thankful for their regenerative farming, makes the earth feel nicer knowing they are considering their impacts and doing their best. I needed some underwear for my toddler (toilet training) and instead of running into the closest target, Kmart etc I researched and found hm have a conscious choice, I paid more but I’m ok with that… also knowing that when they are end of life I can take back to H&M and use their close the loop project. I’ve been after some new clothes for myself (in particular a romper) for ages, and nothing I’ve found ticked all my low tox boxes. Until today! I came across the brand Fabrik- they pride themselves on #clothingwithaconcious. A sustainable studio in Bali which employs local men and women, and clothes are made using natural fibres. Very happy with my organic cotton romper. Buy quality, buy once! The three questions in today’s email are good ones to keep in mind for future purchases- great for the minimalist approach we’re taking as a family too. Such thought provoking questions Alexx which made me realise that although I pride myself on being a ‘conscious consumer’ and am always reminding the hubby that we ‘vote for the world we want with our wallets and purchasing decisions’, I only really turn on this thinking with the more obvious choices. Wheras my go to present choice-books-I don’t ever give a second thought to in terms of how it was made?!? So with Mother’s Day this weekend, I wanted to send a few friends a copy of Jamila Rizvi’s new book ‘The Motherhood’ I already knew that 10% was being donated to CARE which made me happy….but as for the book publisher itself I’d never given it much thought. So thanks to your assignment I’ve spent some time happily perusing their website and am impressed by their commitment to corporate responsibility, from ensuring the paper used is Forest Stewardship Council (FSC) certified, to asking their printers to adhere to Ethical International Manufacturing Standards, to a 100,000L rainwater collection tank for flushing their Collins Street office to their support of great charities such as Indigenous Literary Foundation. And…breathe! Big sigh of relief, I can buy the book in good conscience. Well I’m out on my want. I was looking at getting a couple of knitted throw rugs at Kmart. Firstly acrylic not wool. Acrylic is made of plastic. Acrylic is a synthetic fibre made from a polymer. The fibre is produced by dissolving the polymer in a solvent popping it through a multi hole spinnerette then coagulating the filaments in another solution of the same solvent. They may cause cancer. Washing acrylic garments can release up to 750000 microplastics per wash that end up in our oceans and marine life. 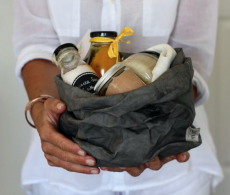 I’d love to win a years supply of Republica organic coffee because…. I love coffee. That’s all. I need some new merino tops, cardigans and socks. I found a Australian company who talk a lot about their sustainable and ethical non-muling practices and how the company is locally owned and operated etc. The only info they didn’t have on their website was about the processing of the wool. Yesterday I sent them an email enquiry and they came back to me stating that unfortunately some chemicals are used in the dying process so their recommendation is to choose items from the natural colour range as these are the least chemically treated. I was really happy with their response as it will help me to consciously choose whether to purchase from them (I do like everything else about them) or whether to go with another company in New Zealand that I found which are utterly completely low tox however are twice the price! And unfortunately my finances cannot justify spending $280 on a plain long sleeved merino top. Ouch. Overall a really pleasant experience finding out about this Australian company who were so happy to provide me with the information that I asked for. 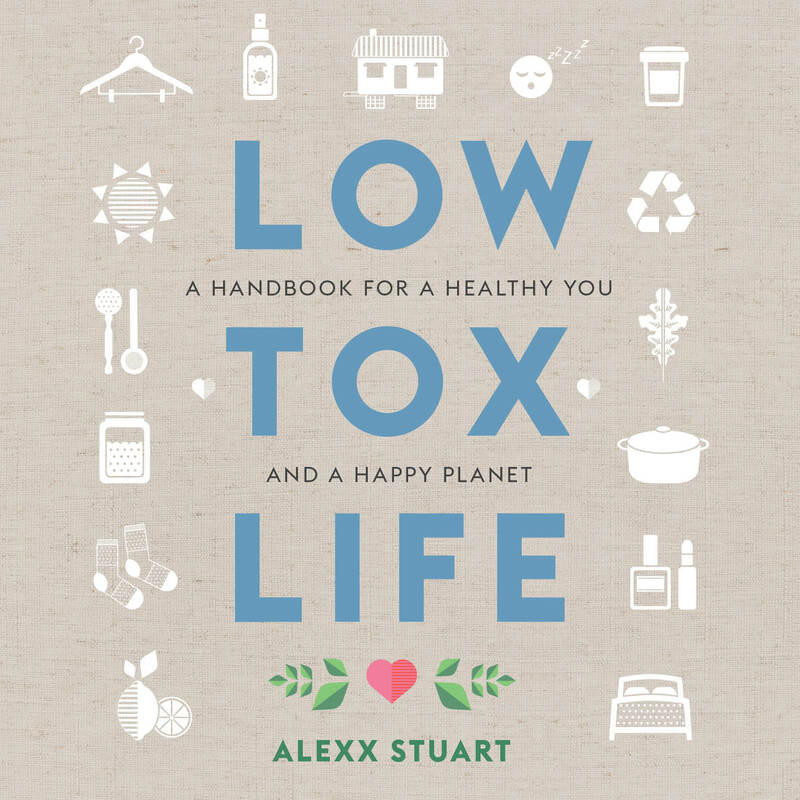 Thanks Alexx and the Low Tox Life course for giving me the courage to ask these questions! My husband is a coffee enthusiast, he wakes up every morning and puts on his machine and he absolutely loves Republica coffee! It’s right up on top of his favourite list of beautiful tasty brews. He loves that its organic and just feels good drinking it knowing that he is doing something good for not only his body but the planet. He would go off if he won a whole years supply of it. The extra good thing is that he is a great coffee maker and he would make it for all of our visitors. And me. And that’s a happy thing. Mmmm coffee 🙂 Since getting a stovetop coffee maker about 1.5yrs ago and having two wee kiddos and diving into homeschooling this year I am all about my rituals to keep me grounded and the art of making coffee in the morning (or sometimes twice a morning!) is one of them. I have a special jar I store the coffee in, a certain spoon to scoop it out and a handmade mug without a handle that I can cup perfectly between my hands. Watching the cream (yes cream) and coffee swirl and merge and change colours is as blissful as the first sip. Especially in this cooler weather! Coffee is my culinary treat so I only buy quality for my faithful teenage coffee machine. I think I have stepped the preferred choice up a rung now, having been introduced to & ordering Republica coffee. Thanks for the generous discount code Alexx & Republica. I love supporting companies like Republica organic coffee that make the effort to be organic and fair-trade. It’s so important to minimise environmental damage and ensure a good living standard for workers. I’m unfortunately in a poor financial state now so affording anything other than the cheapest coffee is where I’m almost at which I hate. To win a years supply of republica coffee would be AMAZING and so appreciated. I’d feel so much better about my cups of coffee each day. Keep up with the good work – you set a high standard for other companies to follow.